‘There are widespread concerns that students with dyslexia are not consistently well supported in their specific needs by all schools.’ PSD Review Report (2016). For more information. THE BIG 5 OF READING Research has shown that The Big 5 of Reading are essential elements when teaching Reading. Contact Karen to discuss your main foci and organise a workshop for your school/group. Are you a small school when funding PD is difficult? Small schools: why not invite staff from other schools to share the cost of the workshop? The information Karen shared was very much what staff needed to help them understand what to expect from students with different learning needs. Her ability to make the content of her presentation interesting and fun was really appreciated by the audience. She was able to resonate with each and every participant. Just a short email to thank you for the outstanding work you have done in providing the Response to Intervention workshops around Victoria. The sessions have been attended by over 200 school leaders and Student Support Services Officers around the state and feedback has been very positive. Karen, your skills and knowledge have been particularly valued in the delivery of this work….. I look forward to continuing to work with you both through the Learning Difficulties and Dyslexia Working Group as we progress the Government’s Inclusive education for students with disabilities and additional needs. Karen, from Dyslexia Support Services Melbourne, presented at MLC Life Insurance in Melbourne on the topic of dyslexia to a mixed group of life insurance team leaders in January 2018. Karen’s presentation, which I also attended, was incredibly well received by the group of predominantly young managers who took away a greater understanding of how to identify and manage dyslexia in the workplace. The presentation was highly informative, engaging and fun owing to Karen’s passion and vast knowledge of dyslexia. Karen also had a one on one consultation with one of our team members who was diagnosed with mild dyslexia following the group presentation. She recommended some effective but simple coping strategies to enable the team member to best manage her symptoms. I would highly recommend Karen to any large business or corporate and would happily have her back at MLC in future years to come. Karen has been instrumental in supporting our school to improve literacy outcomes for all students. Using the latest evidence-based research, Karen was able to complete an extensive audit of literacy in our school, and provided a detailed report and recommendations for further improvement. She then worked alongside the school leadership team to create and implement a literacy strategic plan. Literacy results have improved significantly in the time that Karen has been working with us. Karen has worked extensively with school leaders, teachers and educational assistants to significantly improve literacy standards across the school. 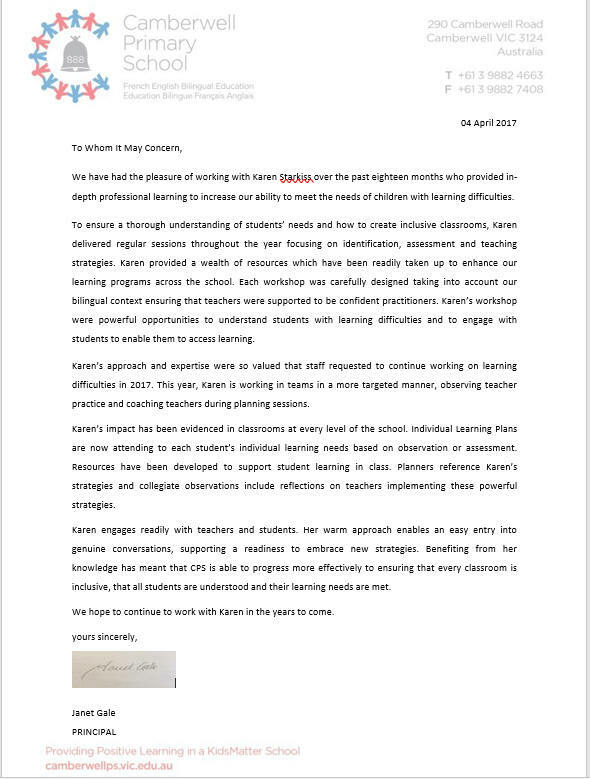 Karen has designed and implemented professional learning for teachers and assistants that has led directly to the improvement of student outcomes in literacy. Karen has successfully led literacy workshops for parents which have been extremely well received and supported by the parent community. I would highly recommend Karen as a literacy consultant for any school aiming to improve literacy outcomes for their students. We have worked with Karen in an ongoing relationship over the past two years. During this time Karen has formed close relationships with staff and has been able to shift the thinking and practices of those staff. Karen has modelled teaching strategies, worked alongside teachers, planned with teachers and lead professional development sessions. Karen is extremely thorough in everything she does and gives concrete examples of research based best practice. I could not recommend Karen any more strongly. She has been a huge asset for us and will be a wonderful resource for any school that is lucky enough to work with her. Please feel free to contact me anytime if you have questions relating to the work Karen has done with our school. des, speech therapists and parents who want to teach their students & children to love reading!